The first artist’s impressions of a dedicated building for Lincolnshire’s planned new medical school have been revealed – and members of the public are being given the opportunity to help support this historic project. Until now, Lincolnshire has been the largest English county without a medical school, without the ability to train its own GPs and hospital doctors. That is set to change. The University of Lincoln and University of Nottingham confirmed in March 2018 they had been successful in their bid to establish a new medical school for Lincolnshire. It followed an announcement in 2017 by Secretary of State Jeremy Hunt of an additional 1,500 medical school training places across England. 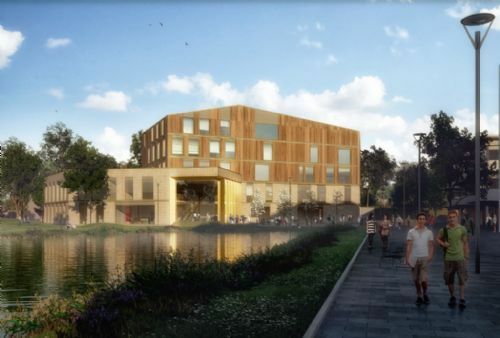 Plans are now underway to build a state-of-the-art facility at the University of Lincoln’s Brayford Pool campus. Current designs for the new medical school building include lecture theatres, laboratories, clinical and anatomy suites equipped with cutting-edge diagnostic tools, virtual- and augmented-reality technology to simulate clinical settings and a science library. These facilities will enable students to understand and master the latest developments in healthcare. The building, which will be located opposite the Isaac Newton Building and adjacent to the existing Science Building overlooking the Delph Pond, will embody the University’s commitment to a low-carbon estate, utilising best practice in sustainable design. The University of Lincoln is launching a major fundraising campaign to help raise funds towards the £21.1 million building, and now local people and businesses are being invited to help create this cutting-edge facility where tomorrow’s doctors will train. Professor Mary Stuart, Vice Chancellor of the University of Lincoln, said: “The support of the community in Lincolnshire was instrumental in the establishment of the University.